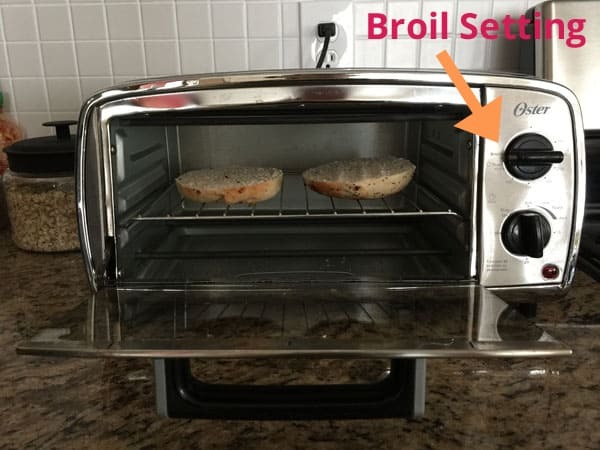 Learn how to toast a bagel in your toaster oven! 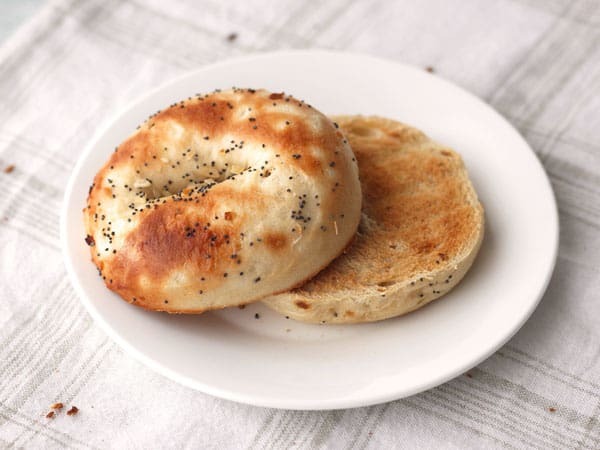 Enjoy a bagel that’s perfectly toasted on top but still chewy in the middle every time using your toaster oven’s bagel function. 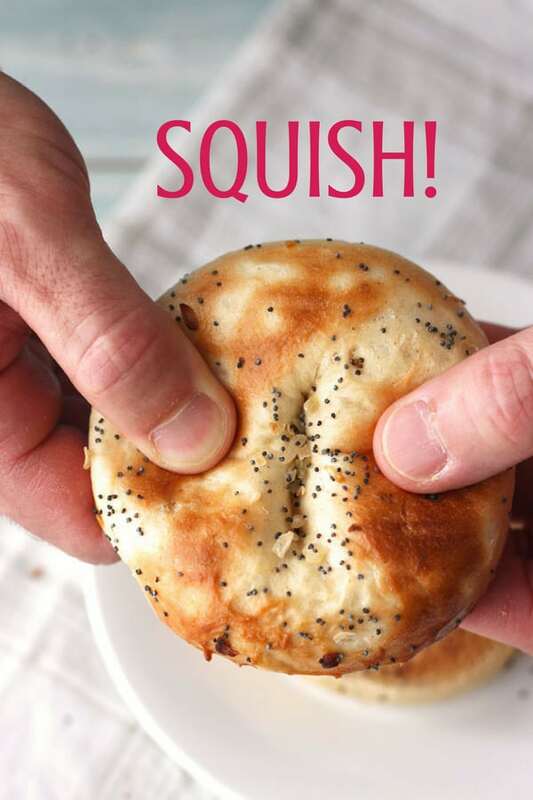 No worries if your little oven doesn’t have a special bagel setting, we’ve got an easy hack for you to try. The humble Bagel function is an easy one to miss. But trust me, it is LIFE CHANGING. At least it was for us and I’m hoping it will be for you too. Life Pre Bagel Function: We’d slice a bagel in half and pop it in the toaster oven to get crisped and golden. After a few minutes, the bagel would be toasty on top but the previously chewy crust was HARD and CRUNCHY. With a Bagel function, like the one on our Breville and Cuisinart toaster ovens, only the top of the bagel slices are exposed to a high heat. Meaning only the tops brown and toast. A lower gentle heat is used for the bottom elements. This way the undersides of the bagel are warmed (not toasted) leaving the bagel’s crust chewy. Life Post Bagel Function: Toasted, chewy, peanut butter-topped bagel heaven! Insert the rack in the middle position and place your bagel slices in the center of the rack with the insides facing up. 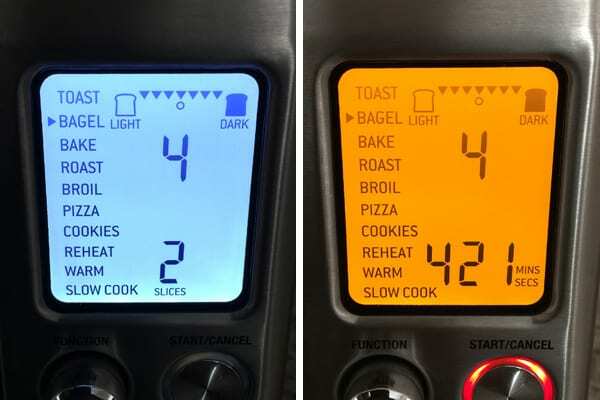 Using the controls on your toaster oven select the desired level of toasting and number of bagel slices. Press start to begin toasting. Overall, our machine’s settings have been fairly accurate in delivering the requested medium toasted bagel slices. Especially for heartier whole wheat bagels. 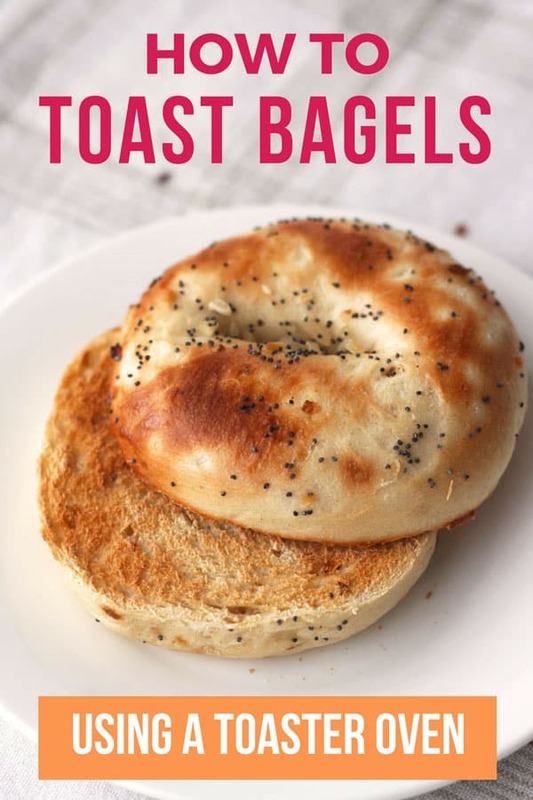 Lighter varieties like onion bagels or those with more sugar like cinnamon raisin bagels sometimes come out toasted a little more than medium. For those, we either reduce the darkness setting or reduce the time by about 20 seconds. Once you press start on the Breville, the area where you selected the number of slices will change to reflect the cooking time. To decrease the amount of time just turn the ‘Time’ knob at the bottom of the machine to the left or to increase the time turn it to the right. Since bagels are only a weekend thing for us, I usually buy a bag of fresh bagels and toss them in the freezer. If the bagels are pre-sliced you can stick the frozen slices right into the toaster oven. 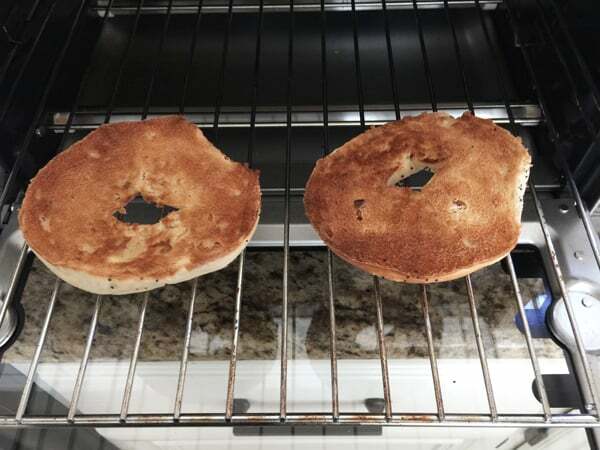 A lot of toaster ovens that have a Bagel function also have a way for you to tell the machine if your bagel slices are frozen. 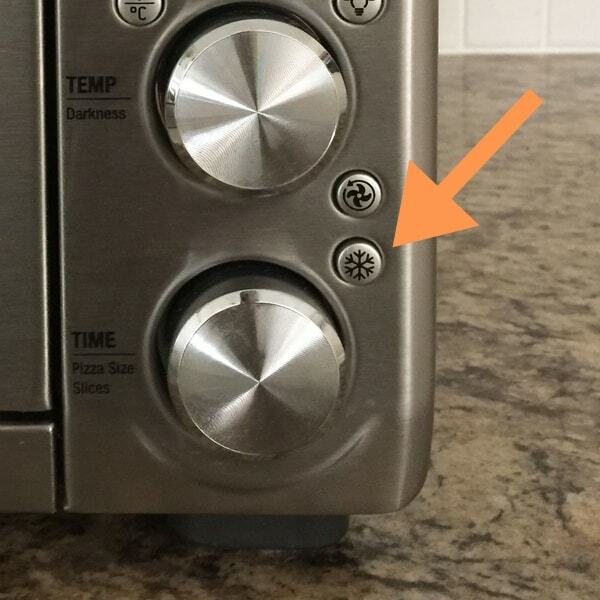 On our Breville, it’s the snowflake button. 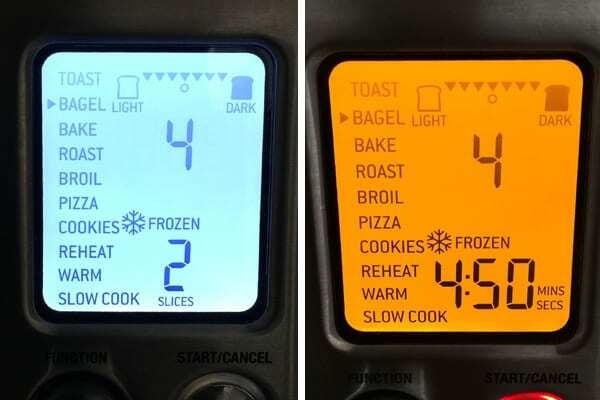 After selecting the Bagel setting, level of darkness, and the number of slices you can press the snowflake button. The toaster oven will then automatically increase the time to include defrosting and toasting your bagel. We rarely use the snowflake/frozen button for bagels because the bagels I get from Trader Joe’s are not precut and trying to slice a frozen bagel is a terrible idea. So I either set a bagel on the counter to defrost or zap it in the microwave for 20 seconds before slicing and toasting. 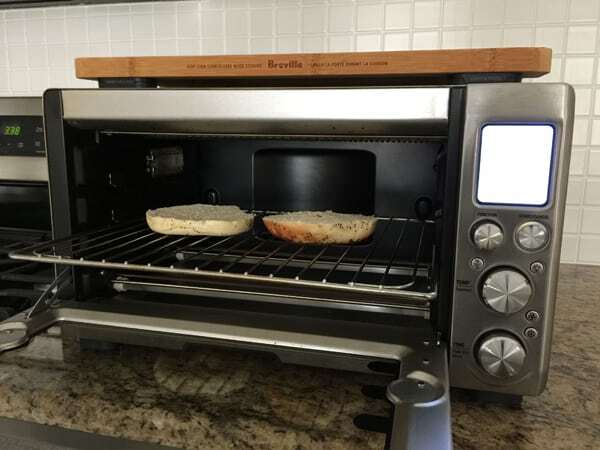 What If My Toaster Oven Doesn’t Have A Bagel Function? You can use your BROIL setting! Did you know that the broil setting on your toaster oven only turns on the upper heating elements? That direct high heat is very similar to the heating of a Bagel function. Insert the rack in the middle position. Place your cut bagel on the center or bottom rack with the insides facing up. Close the door and turn your toaster oven to broil. Broil for 2 to 4 minutes until the tops are golden and toasted. Using our little Oster, with the rack in the bottom position (facing up), it was almost 4 minutes until the tops of our bagel slices were golden. While the bottoms stayed nice and squishy. If you prefer the undersides slightly crisped just flip the bagel slices over and broil for 30 to 60 seconds more. Your bagels may toast faster or slower. Until you get the timing down for your toaster oven begin checking after 2 minutes adding more time as needed. We have not tried this method with frozen bagels. 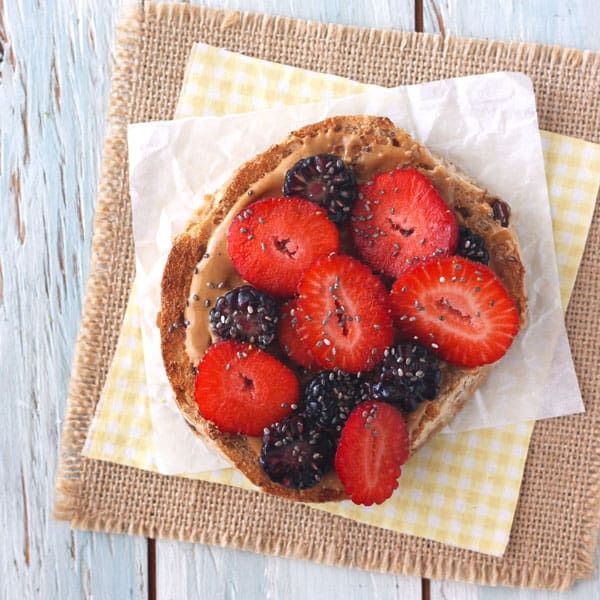 Okay, now that you’ve got your perfectly toasted bagel make sure to check out these 7 Tasty Ways to Top a Bagel. From sweet to savory, there’s a little something for everyone to enjoy.